Candy colours are popping up everywhere this season in clothing, but they are also popping up in home decor. 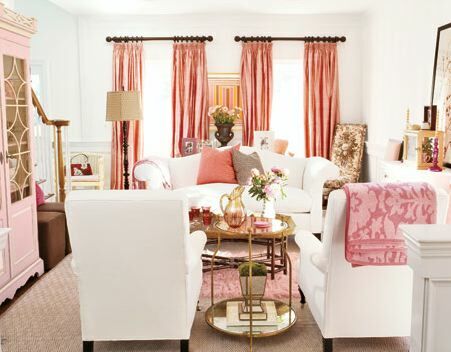 Pink, especially, is being used in a variety of ways to lighten up rooms. Since pink comes in so many different shades - salmon, pastel, fuschia, neon, etc - it's no wonder that more people are accessorizing their homes with this classic colour. I love how creative the use of turning the closet into a desk area is. And you can't go wrong with a disco ball hanging over your desk. One of my favourite rooms by Sarah Richardson. Oh, who are we kidding? I love everything that Sarah does. Even the toys in the basket beside the couch brings in a pop of pink. Another Sarah Richardson beauty. Floor length curtains in a bathroom just screams luxury! Do you think your home could use a little "pink pick me up"? i LOVE the black&white bathroom with the pink accent!